The design of the upcoming limited edition SaGa DSi has recently been released and we at dsigames all agree that it's full of awesome. As mentioned before on this blog, the release of SaGa 2 remake for the DS will be accompanied with its own limited edition DSi. 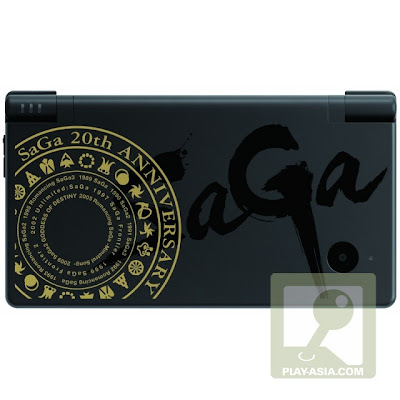 The SaGa 20th Anniversary Edition DSi comes in matte black and features the game's logo. There's also a seal detailing very game in the series. If you want to own this limited-ed dsi, it'll cost you $262.